Remote Work Statistics - Working Remotely in the U.S.
Nearly 50% of Americans say they spend at least some time working remotely or from home. How fast is the remote workforce growing, and what are some of the benefits of working remotely? 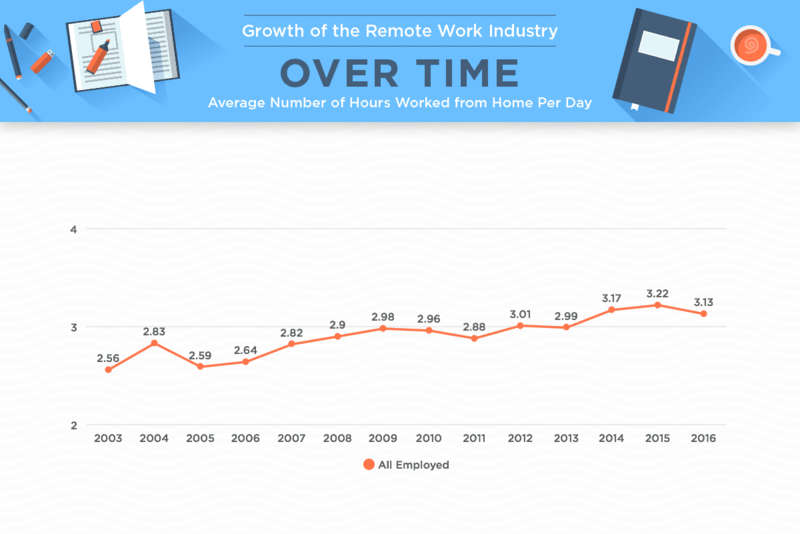 Discover fascinating statistics about this growing employment trend in the U.S.
We’re a team of remote workers at SimpleTexting, and are strong believers in the benefits of a remote work system. According to a 2017 Gallup study, 43% of Americans report spending at least some time working remotely, a 4% increase since 2012, so we’re not alone in supporting this type of work culture. There are numerous benefits to a remote work system, which are catalysts for the industry’s growth over time. It offers flexibility and oftentimes has been shown to result in happier employees. And beyond that, it saves employees both time and money, but how much exactly? Using average commute and gas pricing data, we were able to estimate just how much working from home full time and only 50% of the time saves employees annually in various U.S. cities. Only looking at the cost of gas saved based on average commute times, employees are able to save a considerable amount each year, even those working remotely only 50% of the time. Employees in Atlanta, Georgia, see the largest cost savings—their eliminated commute saves full-time remote workers about $555 per year and $278 for those working from home 50% of the time. This is only one of the many cost savings that can result from working at home. Employees also save from not grabbing lunch or coffee out as often and even not having to purchase as many work clothes each year. Even more surprising than the dollar amount saved by eliminating a commute is the time savings. Full-time remote employees in New York City save about 343 hours per year (that’s two weeks!) by not having to commute, and those working remotely 50% of the time get back 172 hours. These are hours that employees are able to pursue other passions rather than braving the highways or public transportation. It’s also been found that employees end up working longer hours when they don’t have to commute. After seeing the cost and time savings associated with remote work, it seems like a no-brainer to pursue a career that offers the ability to telecommute. As an additional bonus, the in-office vs. remote salaries are very comparable, so you don’t necessarily have to sacrifice on salary for the perks that come along with remote jobs. Using salary data from Glassdoor and FlexJobs, we compared the average in-office and remote salaries of the most common remote jobs. Surprisingly some of the more traditional professions like teaching see a higher average salary when done remotely. In the past, one of the drawbacks of a remote work position may have been feelings of seclusion or a lack of camaraderie with fellow employees, but with the multitude of apps and tools available to remote workers today, it can feel like you’re in the office interacting with coworkers when you’re remote. Skype and Slack top the list of most frequently used communication tools and apps by remote workers, with 56% of companies using Skype and 45% using Slack. With the advancement of communication tools and apps, the remote work industry continues to grow. In 2016, U.S. employees worked an average of 3.13 hours remotely per day, an increase from the 2.64 hour average 10 years ago. It seems women are taking advantage of the benefits of remote work more often than men, with 23.5% of employed women working remotely in 2016 as compared to 21.5% of men. As the remote work industry continues to grow, so does the search interest for jobs that fit the remote work growth on job searching sites like Indeed. While still a small percentage of searches, the growth over the past few years is evident. More Americans are ready to ditch their commute and start working remotely. In summary, the remote work industry continues to grow, likely as a result of the benefits in the form of time and dollar savings it offers its employees. If you’re on the hunt for your own remote position, we’d recommend checking out remote job finding tools like Remote and We Work Remotely.